With an innovative gel-mousse formula and a unique flexor brush that offers mega, supple volume for lush lashes without the flakes. The brush is a little freaky if you forget that it's supposed to bend because it can feel like it's breaking or something while you are using it, it's so springy! Enhanced with rich, multi-tonal pigments for voluminous lashes with deep colour intensity to make your eye colour pop - this is the Navy Velvet shade, you wouldn't look at it and think that I was wearing blue mascara, you have to look pretty close to realize that it's not black. 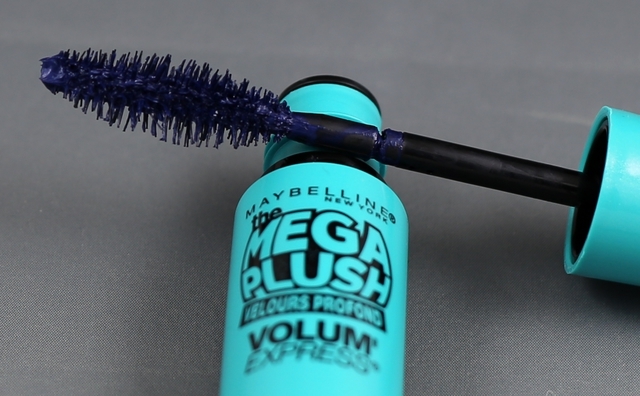 Overall it's fine - it lengthens, it thickens - not the best mascara I've ever used but also not the worst - the colour is what makes it interesting so if you've been looking for a mascara with some colour but not a crazy amount, this is worth checking out!